I mentioned previously that I celebrated the end of my four weeks of vacation by assembling a few stands of wood. Decided to share some pictures, I’m well satisfied with how they turned out. Magnetized, removable and pretty decent looking. The trees are dirt cheap “value bag” model railroad junk – but they fill their purpose. One day, when I’m in retirement I suppose, I’ll paint the trunks properly. 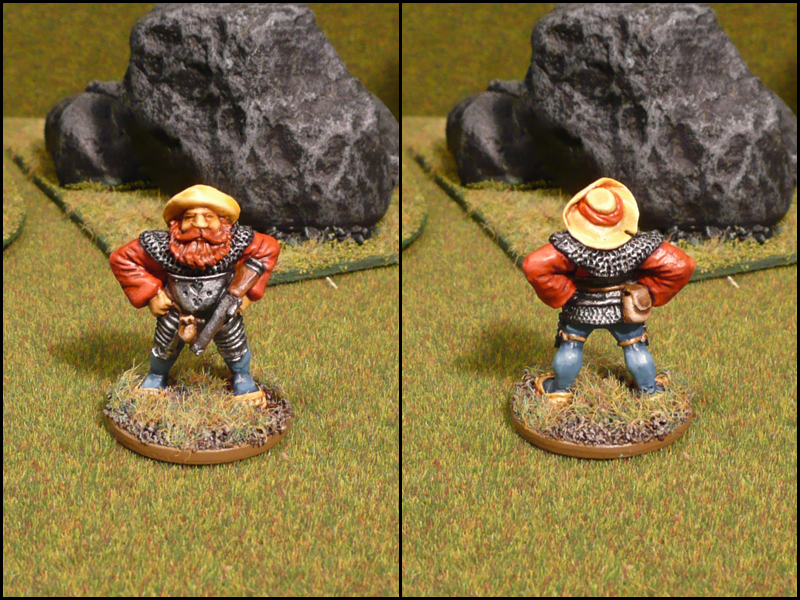 I’ve also prepared a batch of minis to paint up for the next Stillburg scenario (and then some). A bit unorthodox to share pics of them allready, but I’m really looking forward to painting them and what better motivation than to show them in their unpainted drabness?! Guess which one I’m currently painting? 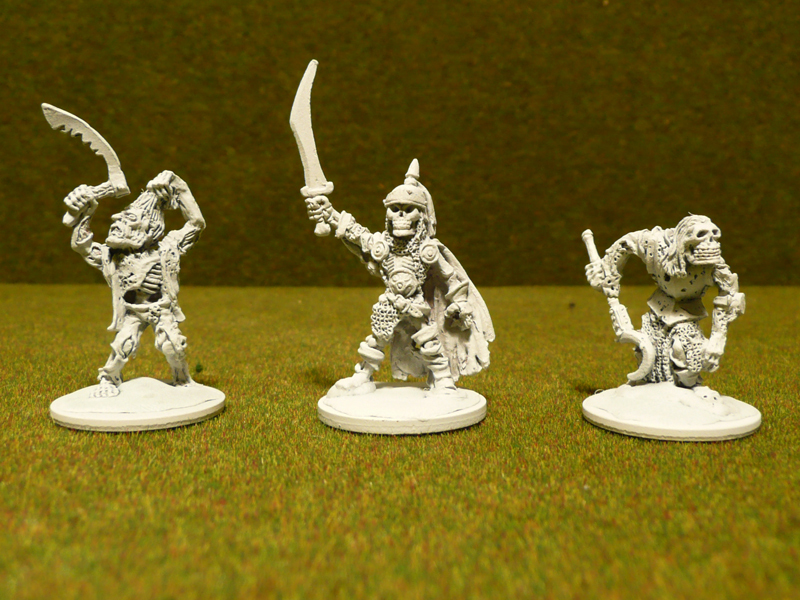 The first pic is some reinforcements for the undead, while the last two are towns people and adventurers who might join the heroes. All are old Citadel stuff. Details when painted and posted with profiles. 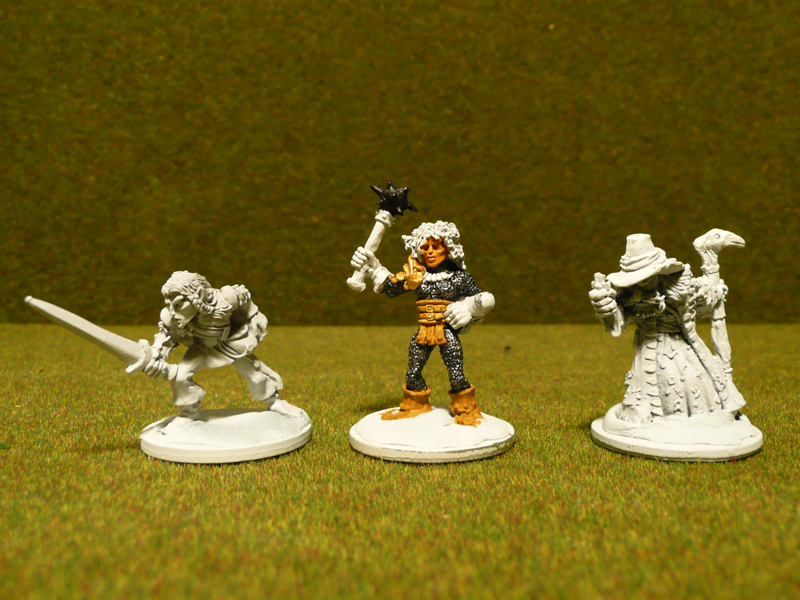 Coming up next; one fully painted mace lady! Just realized I didn’t post any close up shot of the Mayor before he croaked in our first Stillburg scenario. Liked the mini too much to not showcase him in a post, so here he is. Since the photo was taken, I have touched up his beard and face with some highlights. Too lazy to get new photos taken though. He’s a late 80s Citadel fighter from the Fighters/Dogs of War range. Got him from a terribly nice bloke at LAF named Skrapwelder. Not sure when the mini was released, but the earliest mention I’ve found is in the 1988 catalogue. Sculpted by Aly & Trish Morrison I can only assume this is the work of Aly as the ol’ mayor’s face looks quite allright. 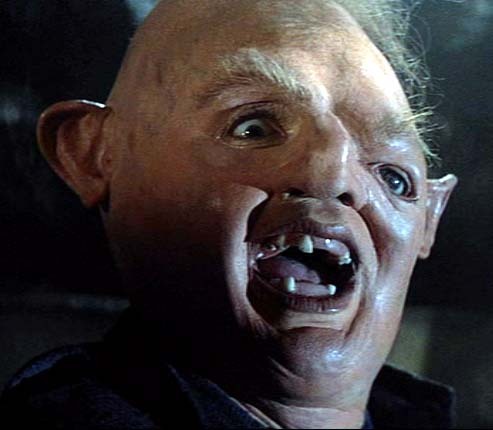 Most human minis by Trish look like Sloth from The Goonies. Phoncible Boismann – Human Mayor. 44 pts. Q3+, C1. Leader, Shooter (Short). Phoncible Boismann is the Mayor of Stillburg. Always looking out for himself, he’s the embodiment of an unscrupulous politician with his own agenda. Ofcourse, he’s trying to maintain an image of a caring all-father watching for ”his flock”. I’ve got more Morrison stuff for you though. 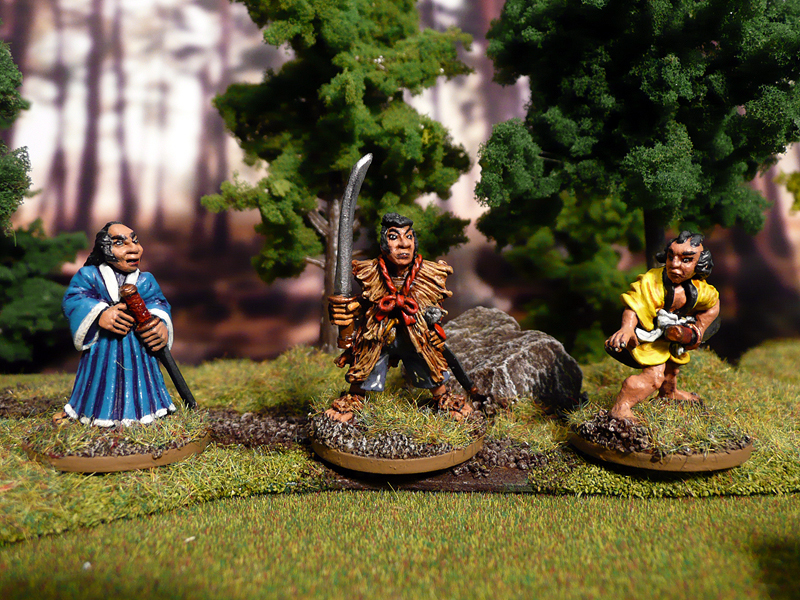 Here are a few old Citadel Oriental Heroes ronin that I bought from fellow LAF:er LeadAsbestos. The three guys in the first picture were painted by him, and I decided to not strip them as they looked too good! After I rebased them, they blend in just fine with my own miniatures. The guy in yellow clothing is a solid-base mini from the C05 range. The other two are from OH2 ADD Samurai (centre) and OH4 Ronin Renegades (left). In addition to these three I also purchased an OH5 Oriental Champion, but it’s not painted by LeadAsbestos but some random eBay seller who he in turn purchased it from. I’ve got a plan on how to use these in the Songs of Stillburg campaign but it’s still only in the draft stage. 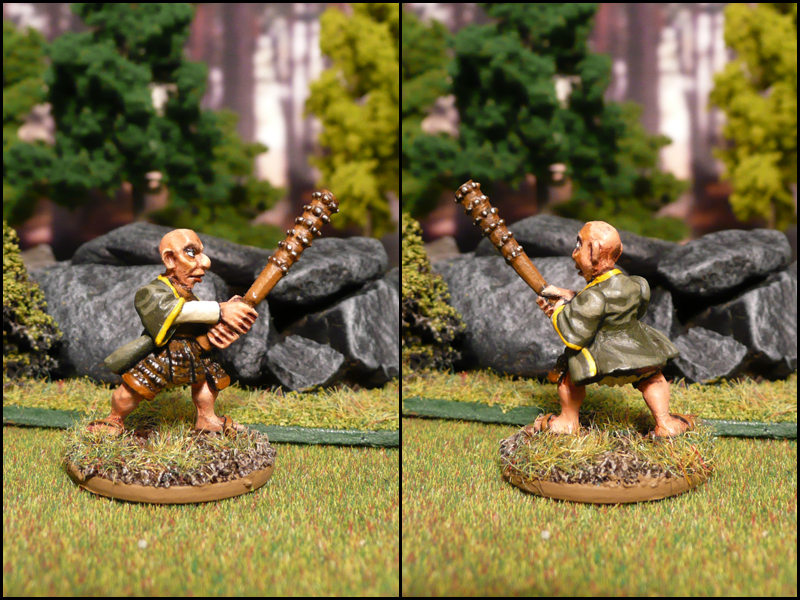 The bald headed fella is a fugitive from Nippon (egads, GW – you could’ve tried harder when you made your not-Japan fluff for Warhammer!). He carries with him some artifact, scroll or other magically potent trinket. The daimyo of his home province seeks this artifact for some dark, nefarious purpose. Thus three ronin have been sent after the fugitive across the world and the heroes of Stillburg will get caught inbetween. They can aid the fugitive in combat and if successful gain him as a (quite lethal) member of their warband. That won’t be easy though, as the ronin are deadly opponents. Coming up next: I made more woods this weekend (some seen in the last two photos). Also, I’ve started painting the first female cast member of the Stillburg campaign! For a while, we’ve been talking about how an SBH game with nothing but zombies on one side would play out. About a month or so ago, we decided to do a trial game. With the rules as written, it would be near impossible to do anything reasonable. We noticed several issues, mainly with morale of the zombies but also with activation. The biggest problem is logistical, though. It takes quite some time to roll activations for 38 zombies! To get around this, we agreed that all zombies more than a Medium range from an enemy could be batch-activated. I had one dice for each zombie, put them in a plastic container and rolled all of them in one go. I then assigned the successful activations to the zombies I wanted to move, alternating between the front ranks and the back ranks. Another change we made was to the morale rules. A zombie witnessing a gruesome kill would have to succeed with ALL three morale dice to not be instantly destroyed. That simply wouldn’t work. One of the first kills was a gruesome kill, and it took out 10 zombies. We decided that for this scenario, all zombies would have to count as fearless. As we didn’t want to remove the effect of a gruesome kill completely, any zombies within a long range are “stunned” one turn for each failed die in the morale check. We played this game prior to the first Stillburg game, where we tried a different approach. Haven’t decided which to use in the long run. Prior to the game, we also changed the stats line of the zombies. Instead of Q6, C4, Undead, Slow, Short Move at 8 points, we instead went with Q5, C2, Undead, Slow – still at 8 points. All changes were made to emphasize on what we feel is the strongest point of zombies; numbers! With a higher Quality, Medium move and the batch activation rules we could make the zombie horde maneuverable but with a fairly low Combat. We also used the modified turn over rules as described in our house rules. * Zombies within movement range of an enemy model must be activated individually. All others can be batch activated; rolling 1D6 for every model, allocating half of the successful activations to the front rank and half to the back ranks. 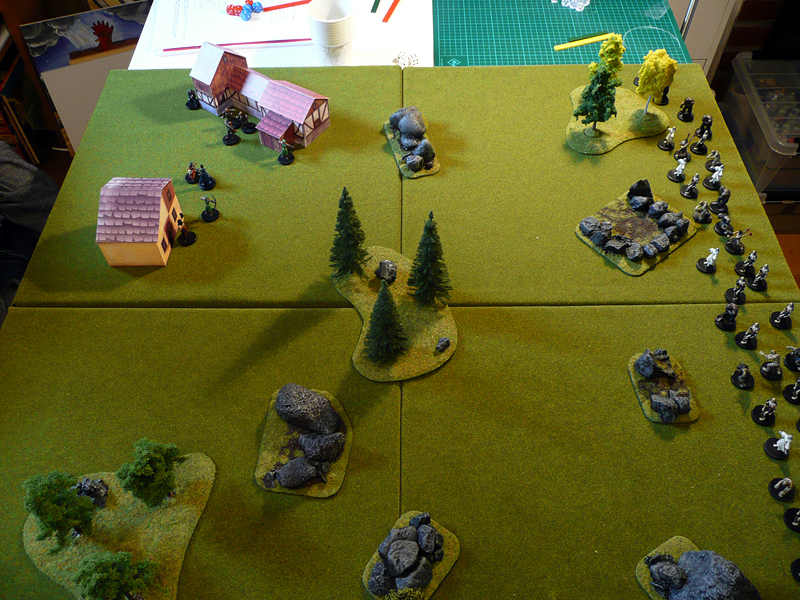 The goal of the scenario was for the villagers to fend off all zombies. The zombies had no goal, other than to devour any and all brains on the board. My warband consisted of 38 zombies, with stats as mentioned above. As I don’t own 38 zombies (yet), we had to settle for proxies on some. This is an overview of the setup, prior to turn 1. 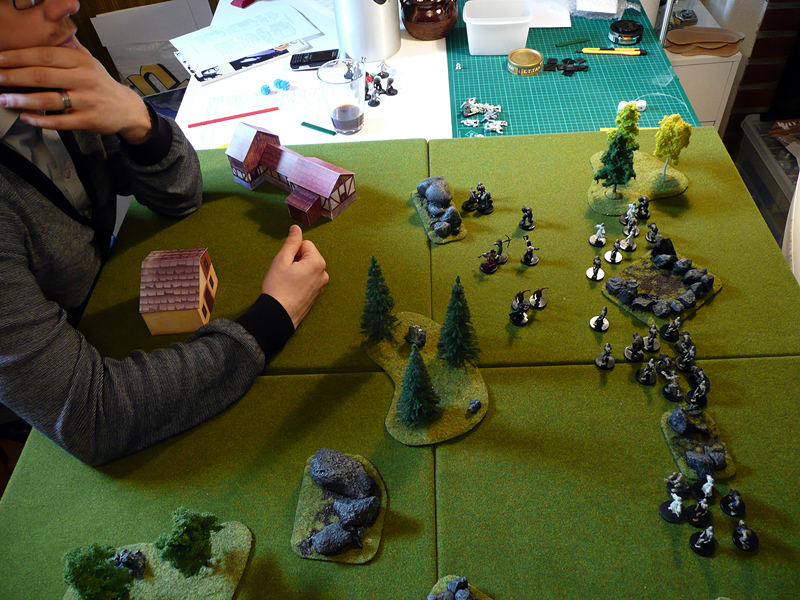 As you can see, for this game we used only plastic pre-painted D&D miniatures. 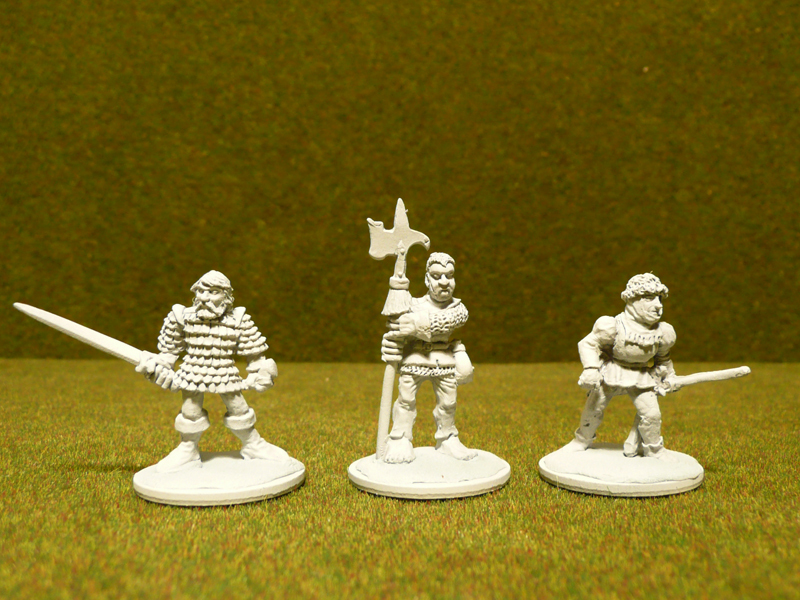 I’m working on building a collection of painted Citadel vintage miniatures but the D&D minis are great for one-offs! 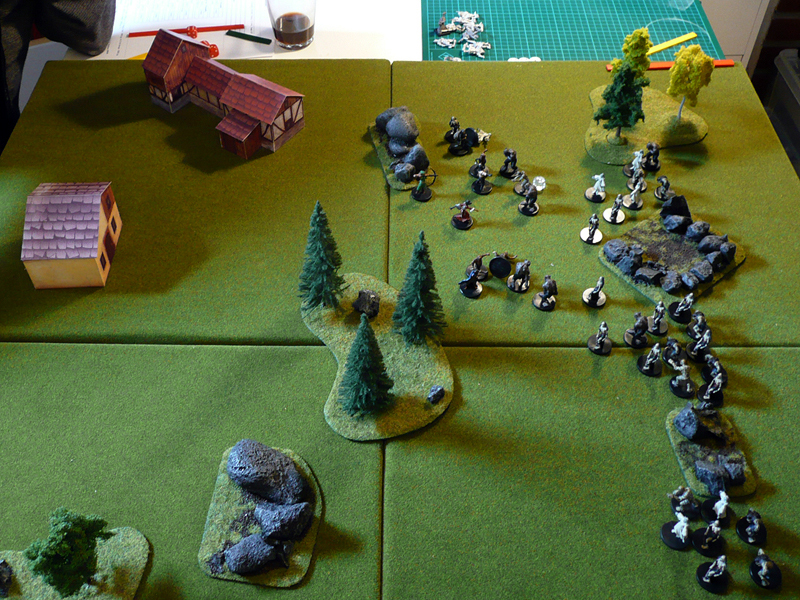 The two first turns were fairly uneventful, I won initiative and went first with the undead. 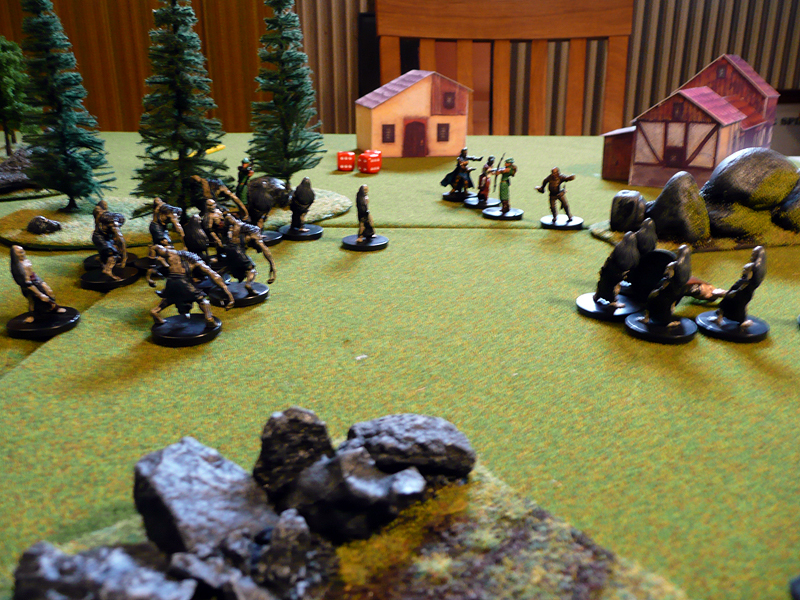 The villagers spent their turns positioning themselves while the undead horde shambled forward. A few pot-shots were taken by the archers, but they were very ineffective. In turn three, the first casualty was suffered by the undead. 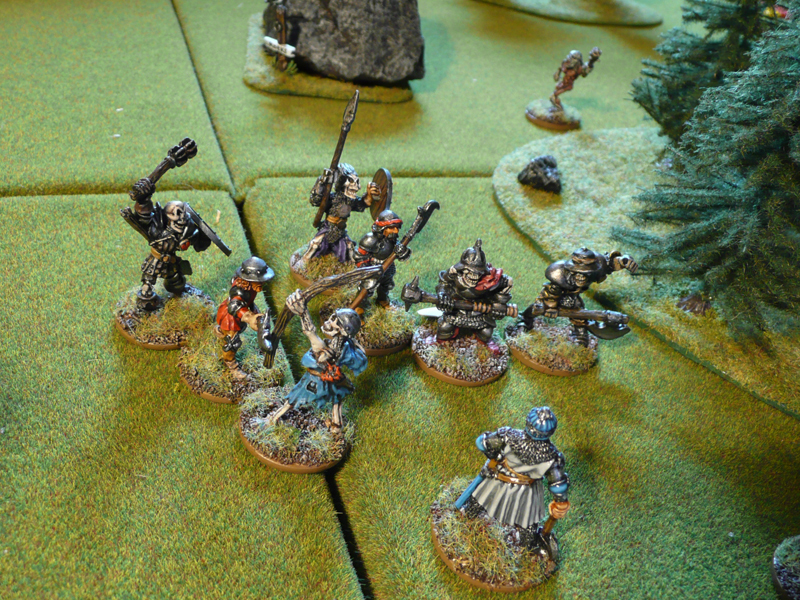 The berserker scored a gruesome kill and almost a third of the zombie hord was stunned. It looked like this would be a walk in the park for the defending villagers, who got cocky and took on a more offensive role than I had anticipated. Slowly, the undead wittled away. The occassional scare occurred, when the undead managed to attack and a villager fell – but they survived and could recover and fight on. In a series of unfortunate events, it all turned though. 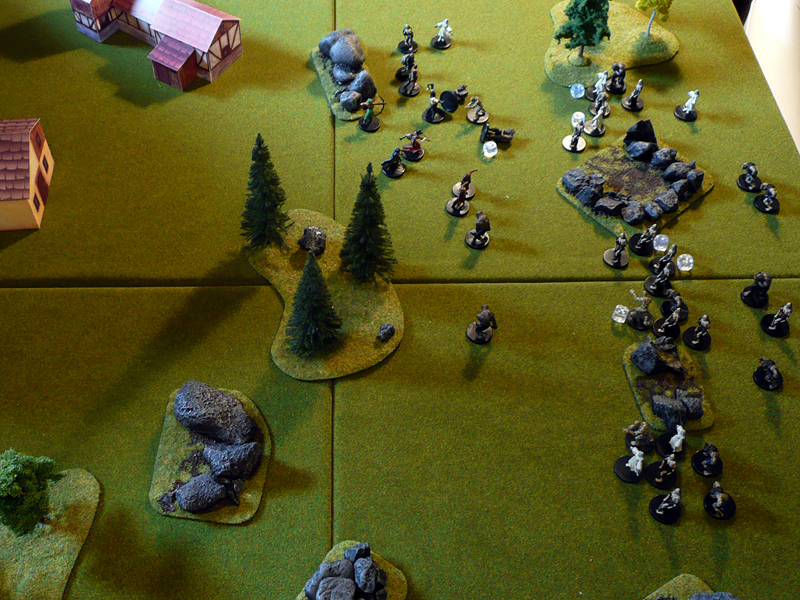 With two unlucky and early turn overs for the villagers, the undead could advance en masse. They gathered around their victims and the first casualties were a reality. A poor drunkard had been completely surrounded by the walking dead, and suffered horrible (but not quite gruesome) death. However, when the thief fell and the flesh eating abominations descended on him, the majority of the villagers retreated. At this point two villagers had perished, while only fourteen zombies remained! The berserker (the town’s resident torturer – no village should be without one!) was fallen and surrounded and would most certainly be devoured in the following turn. Unfortunately, we had to end the game at this point due to real life commitments (curses!) but such a great time was had that we’ll replay it (with some changes) as part of the Stillburg campaign. We’re also planning to do a Mutants and Death Ray Guns variant of it – if we ever get around to that system and setting. In The Riding, a small backwater province in The Old World, lies a small town named Stillburg. Situated north of Averridge and surrounded by dark forests, life has never been easy nor much fun in Stillburg. Recently, this has taken a turn for the worse. Livestock have been found mutilated and torn asunder, and several supply convoys from the south have gone missing. At first people blamed the wolves in the region, and wanted to organize a hunt. However, when a full pack of wolves was found torn to pieces the towns-folk started to get scared. Nobody talked about organizing any hunts after that. Instead, fortifications were made on the town borders and mercenaries were recruited to bolster the town’s small militia. Among these mercenaries, we find Raab the Barbarian and his old friend and partner Aldor Berlepsch. A few uneventful days after their enlistment, Raab and Aldor were spending the afternoon listening to yet another speech by the mayor. A sudden commotion in the north end of the square brought a premature (and appreciated) end to the speech. It was old farmer Crabcock, screaming at the top of his lungs that ”they got him”. Aldor and Raab decide to join, to make some quick coin and then get on with their travels north to Norsca where they plan to rejoin Raab’s brethren. How dangerous can a few reanimated skeletons be? 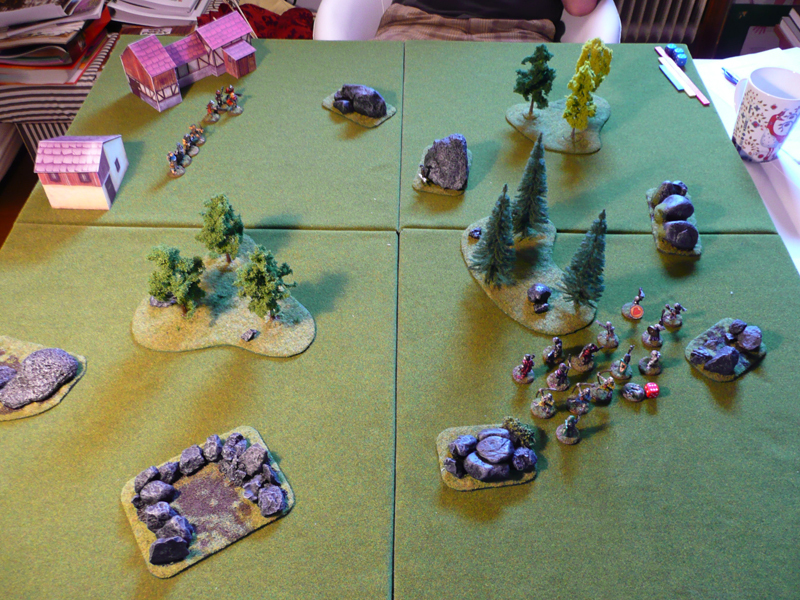 Woods and stone mounds, with one or two village houses near one corner of the board. 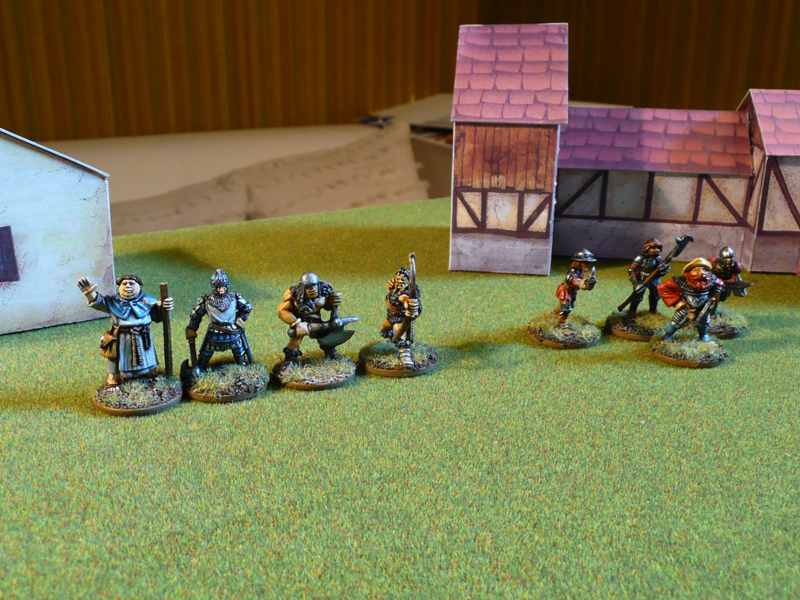 The heroes are deployed within a short distance from the buildings. On the diagonally opposite quarter of the table, the (still living) body of Billy Crabcock is placed. The undead are deployed within a medium radius around him. Brother Wendel, human cleric (50 pts): Q3+, C2. Cleric. Duncan Sandels, human paladin (46 pts): Q3+, C4. Steadfast. Raab, norse barbarian (39 pts): Q4+, C4. Fearless, Savage. Aldor Berlepsch, human ranger (50 pts): Q3+, C3. Forester, Shooter: Long. 3x Town militia (Sven, Hans, Bo – 23 pts): Q4+, C3. Mayor Boismann, human mayor (44 pts): Q3+, C1. Leader, Shooter: Short. 8x Skeleton Warrior (26 pts): Q3+, C3. Slow, Undead. 3x Skeleton Archer (24 pts): Q3+, C2. Slow, Undead, Shooter: Medium. 3x Zombie (8 pts): Q4+, C2. Slow, Undead, Short Move. The heroes win initiative and activate first. They all move up the centre, with Raab and Aldor on point and the mayor with militia bravely protecting the rear. 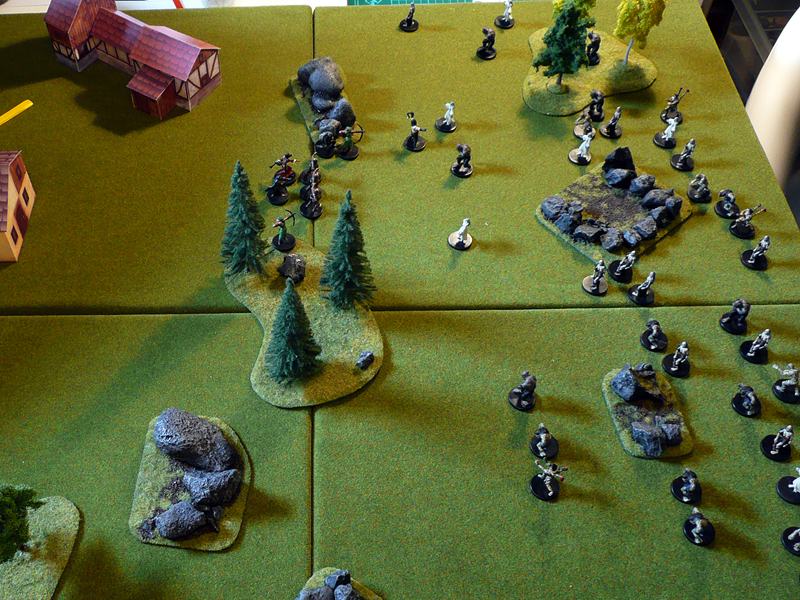 The undead breaks up in two groups; one larger group advancing towards the heroes while a small group of two skeletons and the three zombies advance on the right flank in cover of the woods. The three skeleton archers each take a shot at Raab, but at three times the distance it has no effect. 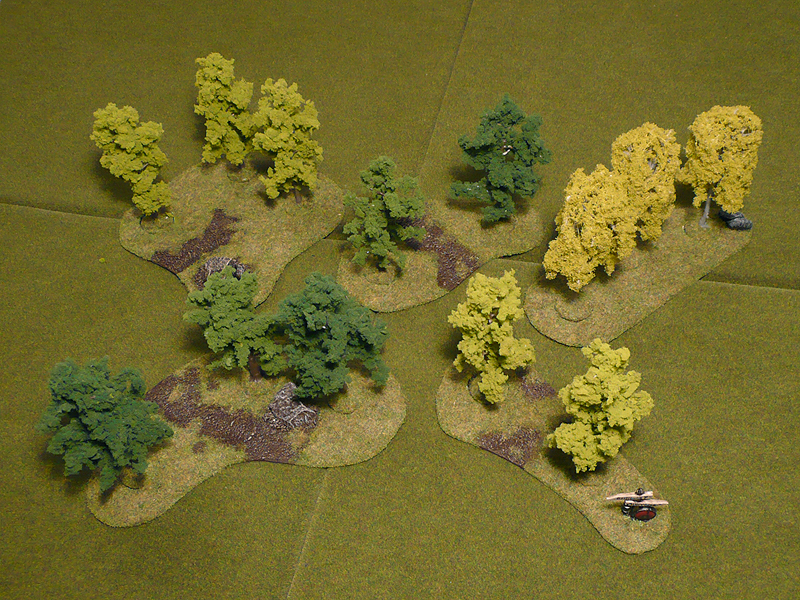 Aldor and Raab then move into the woods on the right flank, while brother Wendel and Duncan enters the woods on the left flank. The mayor, in a rare display of bravado, moves up the centre with only one militiaman as a shield to act as bait. All but one skeleton move up and form a line in front of the skeleton archers. 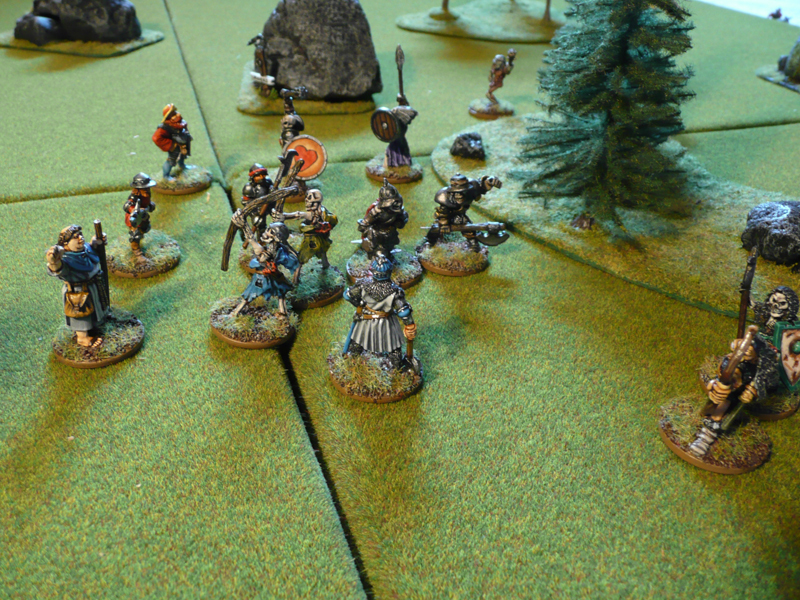 All three archers shoot at Sven, the closest militia man, who falls on the last (aimed) shot. 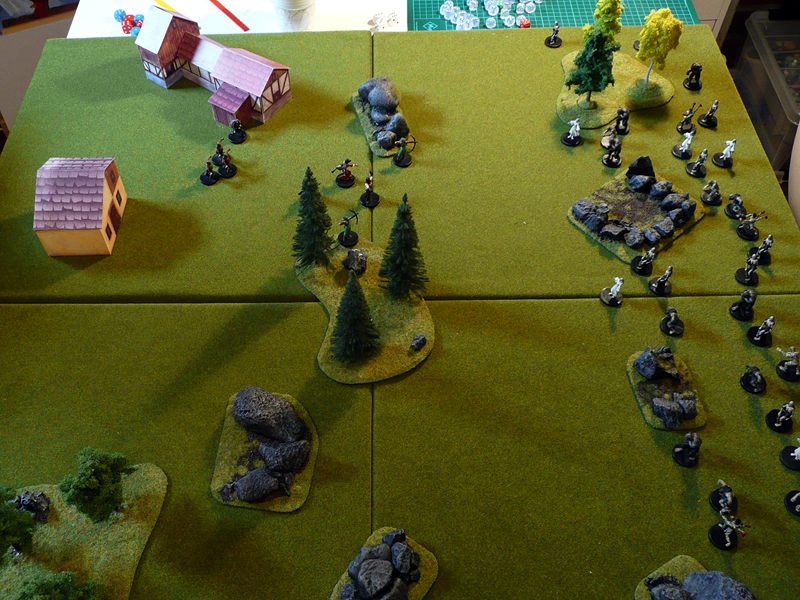 On the right flank, the zombies and two skeletons slowly advance. 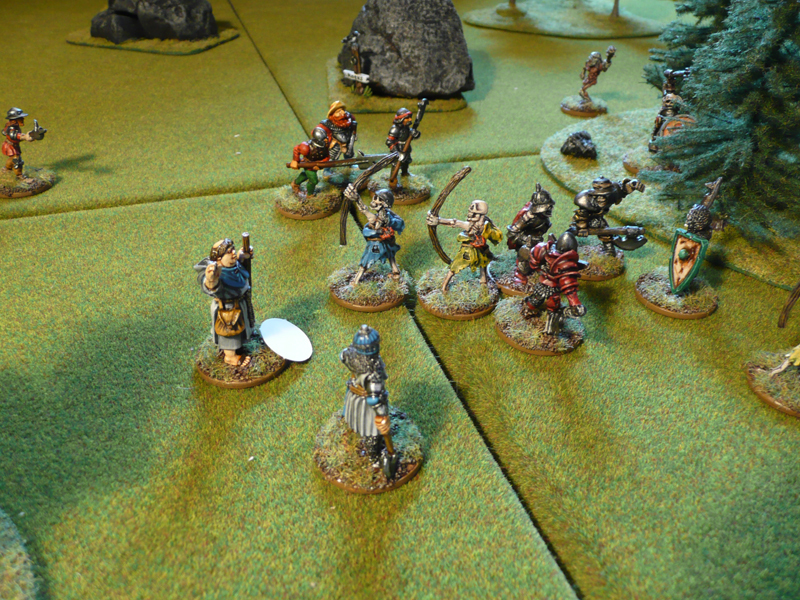 Sven recovers from the archers’ attack and stands up. Aldor is running unhindered through the woods with the goal to reach Billy as quick as possible. 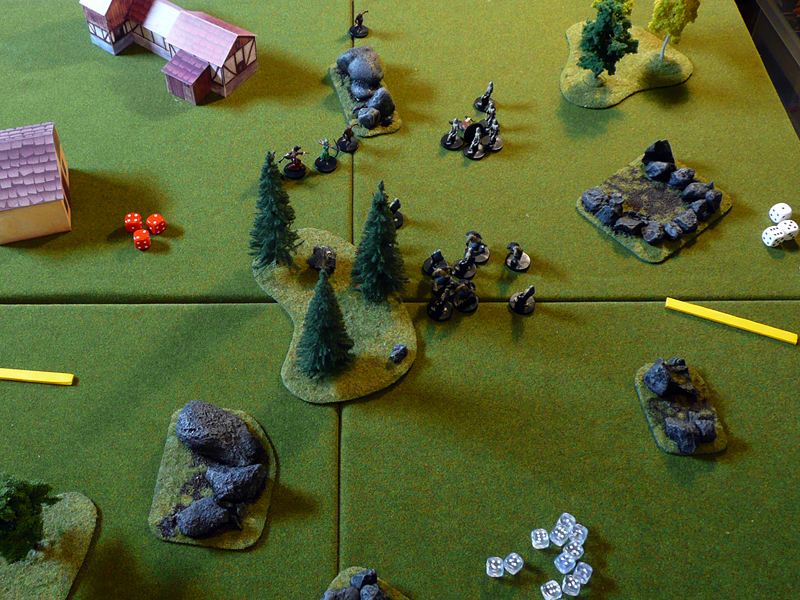 In a coordinated ambush the heroes break cover from the woods and attack! 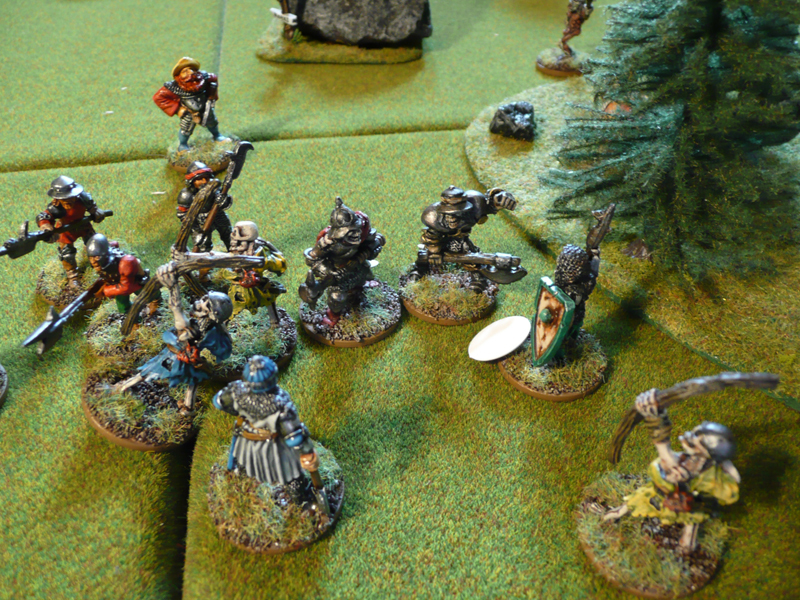 Duncan and brother Wendel leap out of the woods on the left side and attack two skeletons. Duncan manage to hit, but his opponent is only pushed back. Wendel on the other hand, scores a solid hit and destroys the vile skeleton with divine aid. 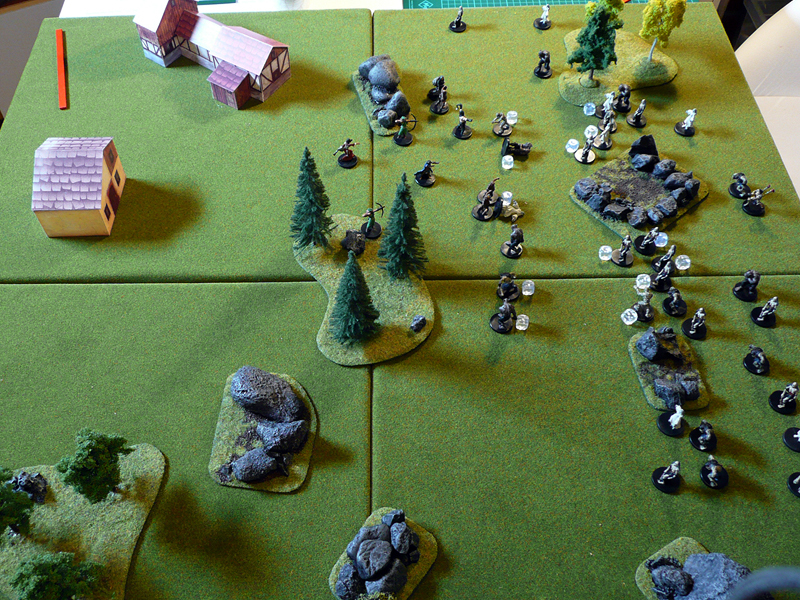 In blind frenzy, Raab rushes out from the woods on the right, straight into a surrounding circle of skeletons with no actions left for attacks. 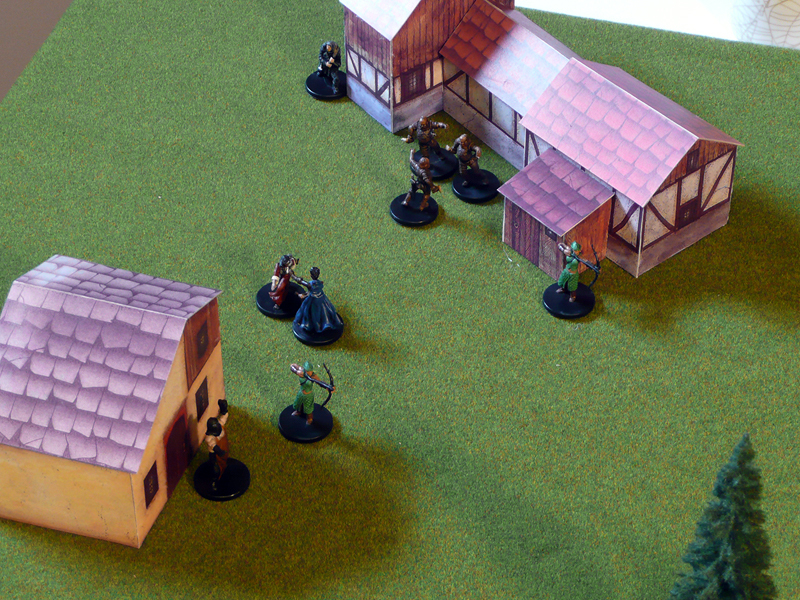 The militia moves up to shield the mayor, who fires with his pistol over their shoulders but miss. The trailing skeleton rushes up past Duncan to attack brother Wendel, but the attack is parried with ease and the cleric repays the attacker with a crushing (and quite holy) blow to the skull. 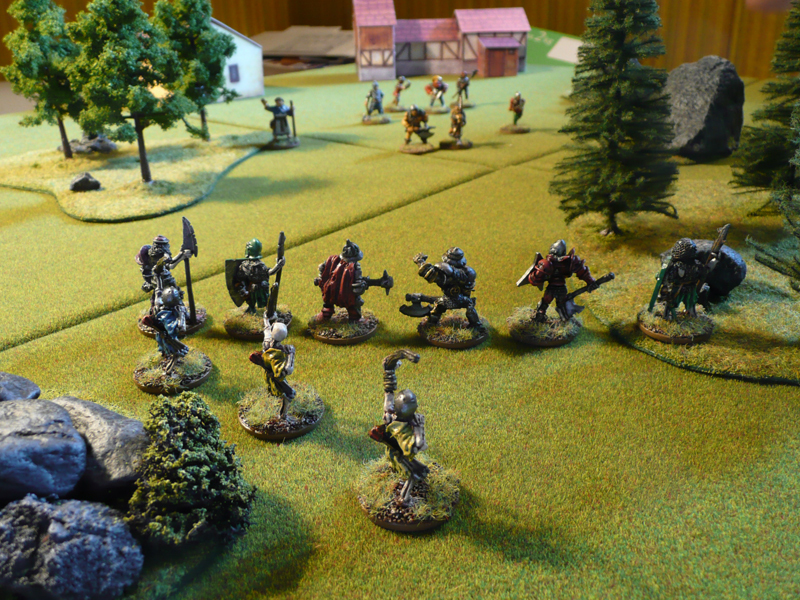 Two skeletons near Raab gather around him and the barbarian realize his folly. Outnumbered three to one, a fourth skeleton moves in and with a precise blow the mighty barbarian is overpowered and falls. A fifth skeleton approaches the fallen warrior and finishes him off. 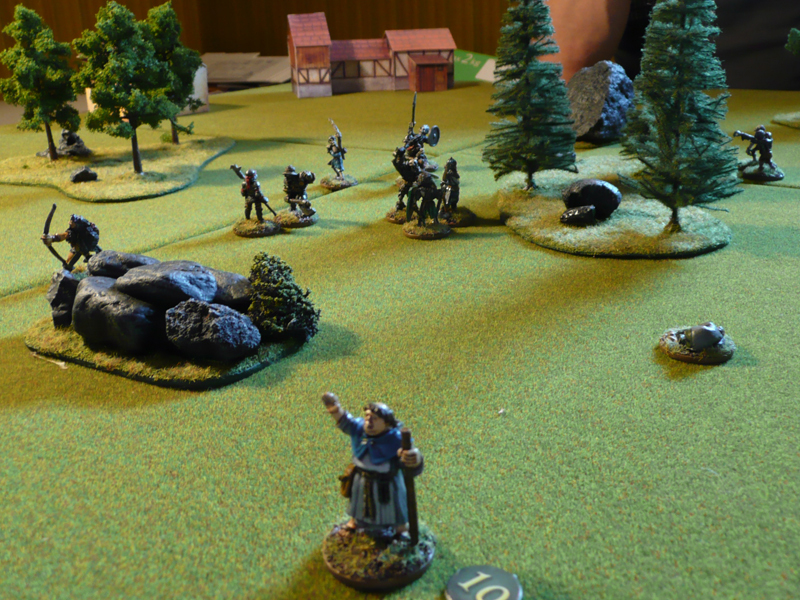 The archers fire at brother Wendel, who falls when dodging the fussilade. 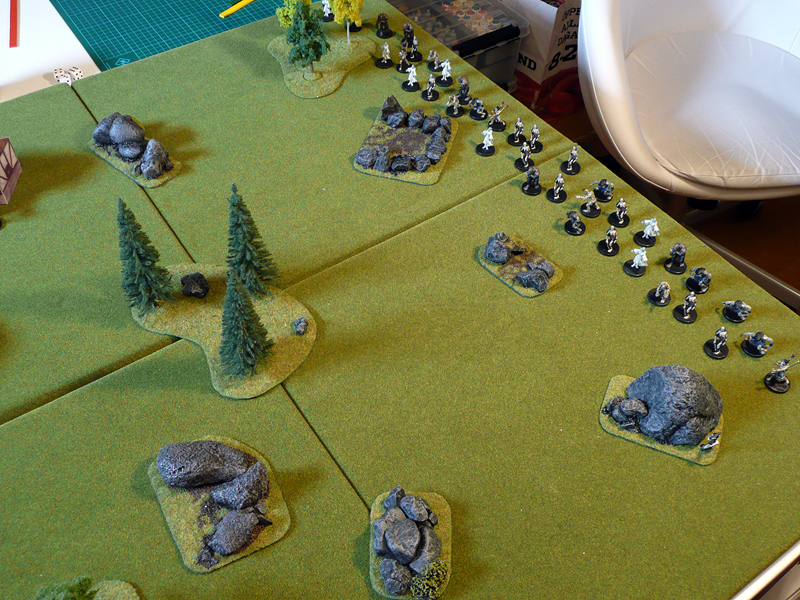 On the right flank, the skeletons rush through the woods while the zombies continue circling around it. 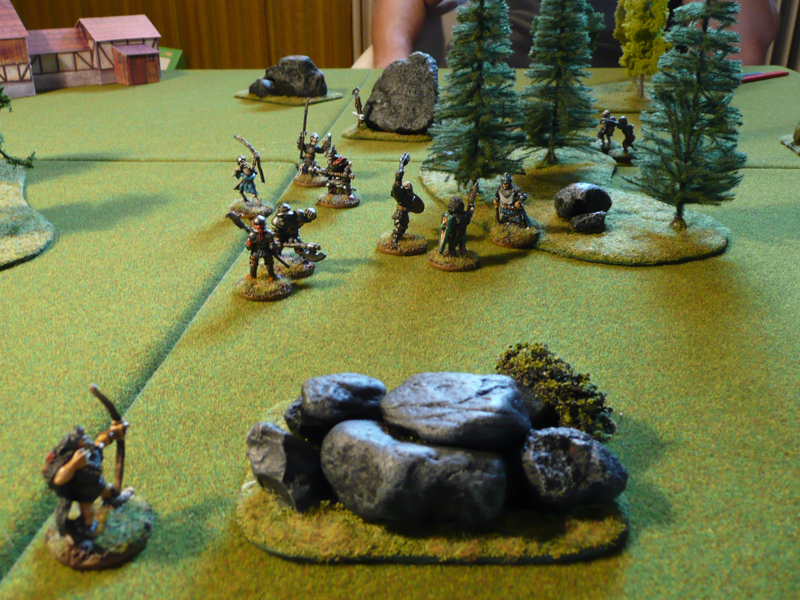 The militia men move in and engage the archer skeletons, with no effect. 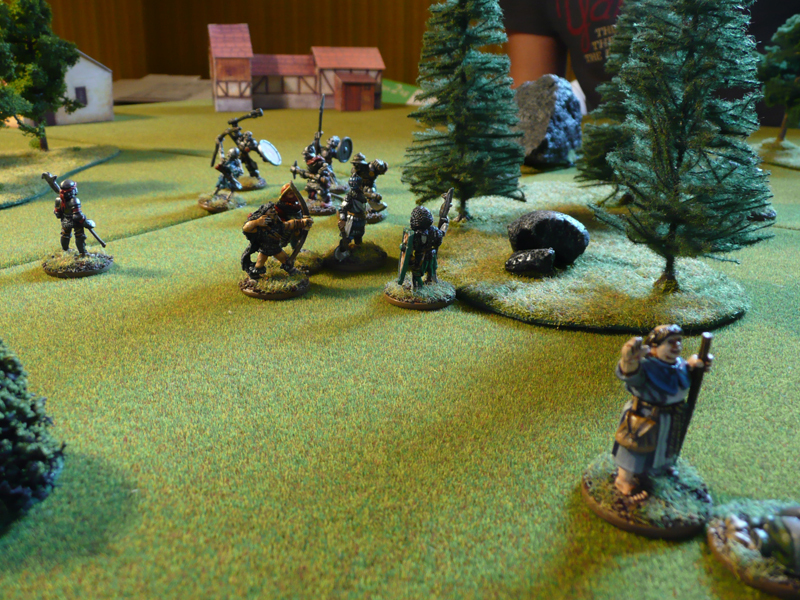 Brother Wendel stands up and attacks one of the archers, but loses his balance and stumbles back. Duncan does a powerful attack on one of the skeleton warriors and scores a gruesome kill. 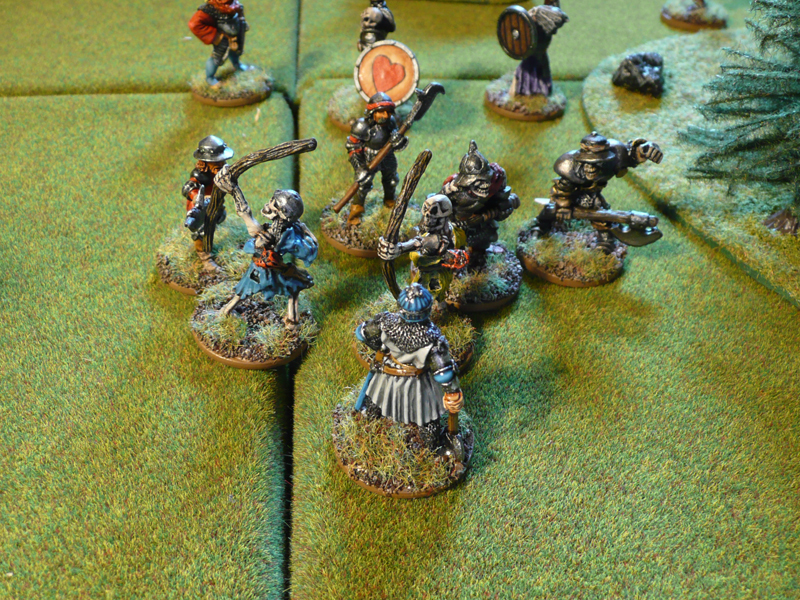 The three skeleton warriors in range are transfixed, while the three archers are unaffected. 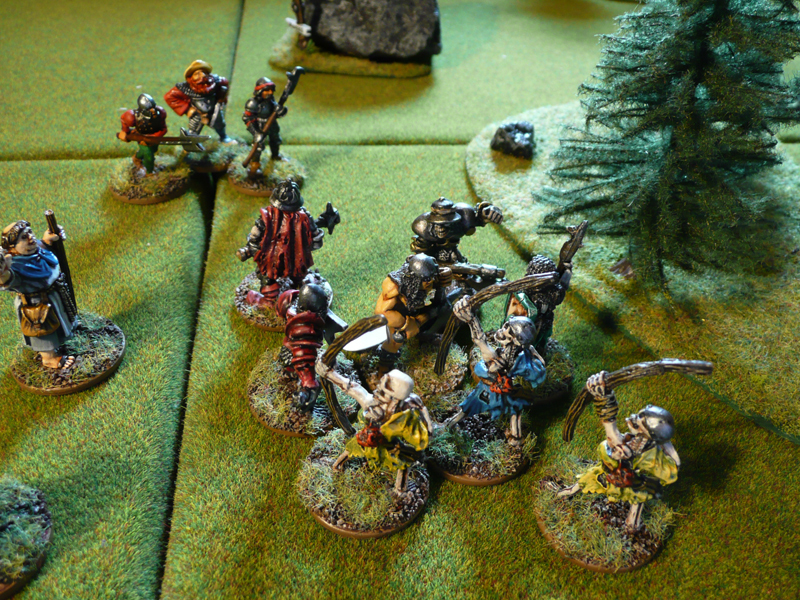 Aldor emerge from the woods to ambush the rear skeleton archer, who is killed. The mayor fails to activate. 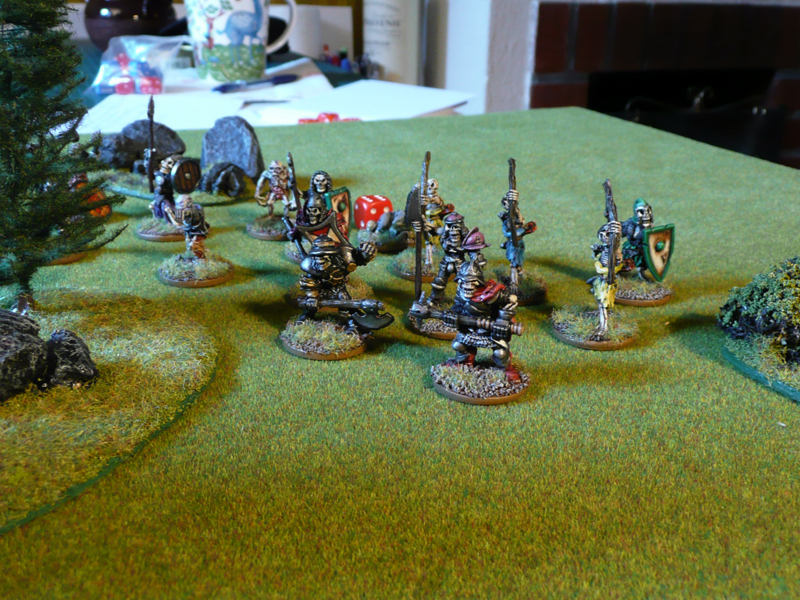 One of the skeleton warriors shrugs off the transfix, and moves to engage Aldor. 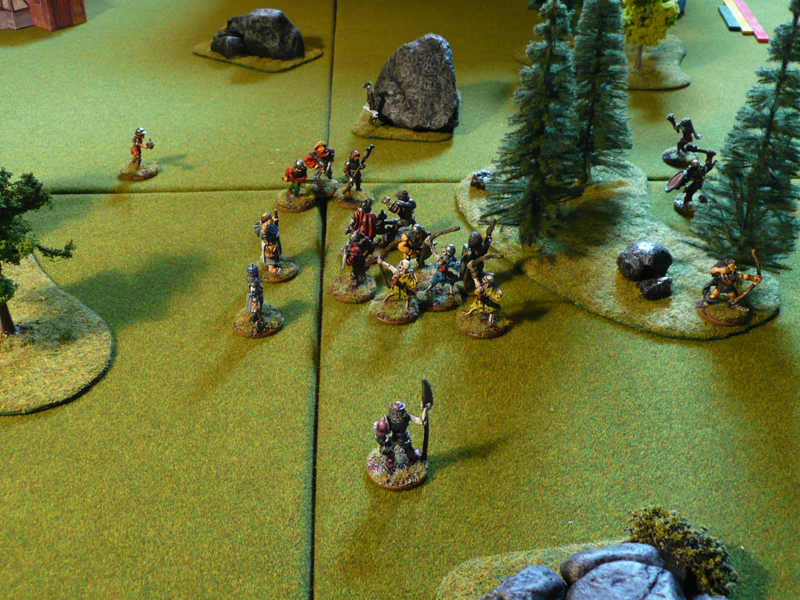 The two remaining archers take turns attacking Sven, the militiaman. The first attack brings him to his knees and the other archer finish him off. One of the skeletons in the right flank woods run out ambushing mayor Boismann, who is pushed back but otherwise unharmed by the assault. Bo attacks a skeleton archer and pushes it towards Duncan, who finishes the archer off with a powerful attack. Hans moves into contact with one of the transfixed skeletons while brother Wendel rushes to aid Billy but doesn’t quite reach him. In an unusual display of bravery, mayor Boismann moves to assist Aldor in the fight with a skeleton warrior. 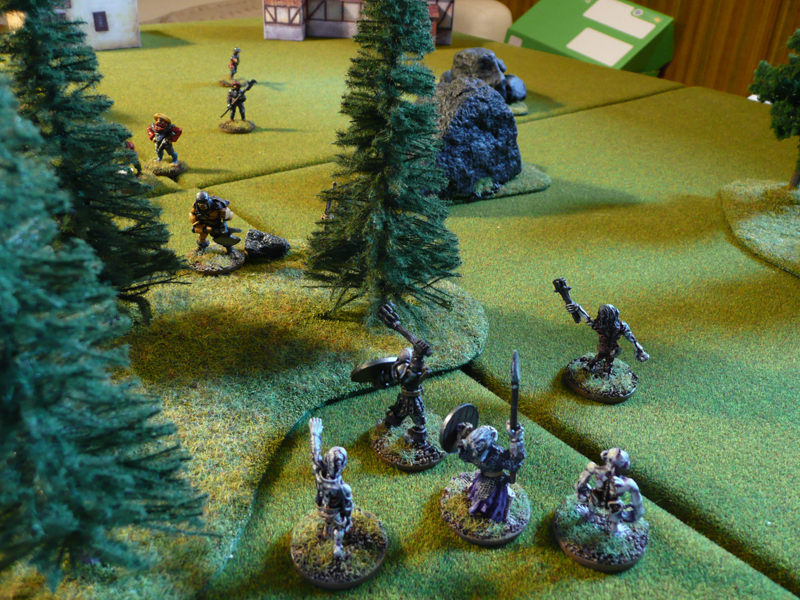 The ranger fails his attack and is pushed back by the foul undead. 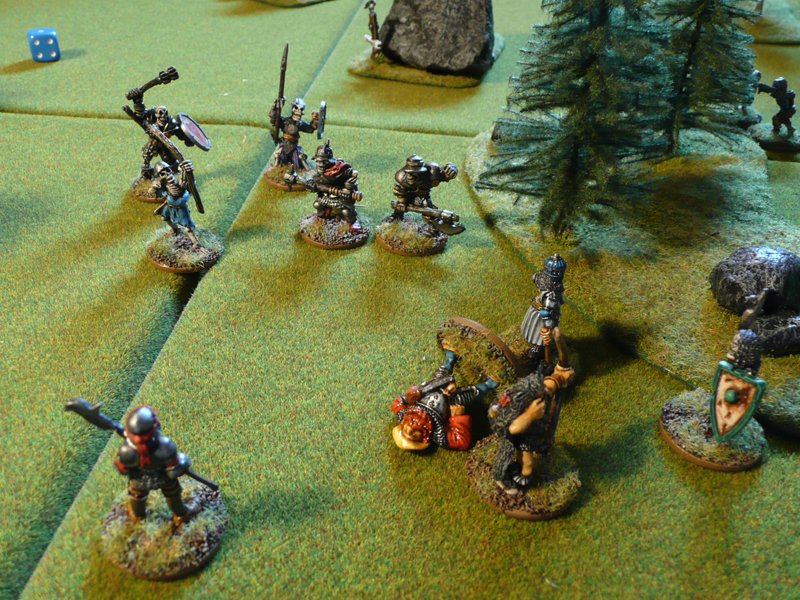 Another skeleton warrior recovers from the transfix, while the two farthest skeletons move in behind Hans and Bo. 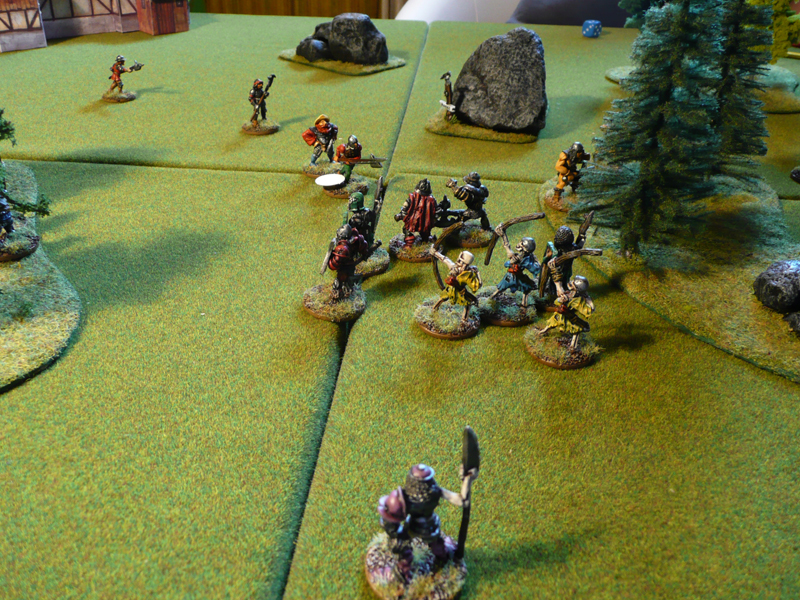 The archer does a powerful attack on Bo and scores a gruesome kill. Seeing his last comrade fall, Hans flees. Duncan stands alone, facing five skeletons! The skeleton warrior engaged with the mayor activates with three dice, causing a turn over but one action is available. The mayor is attacked and falls. Brother Wendel reaches Billy in the nick of time and is able to stop the bleeding on the young man. Mayor Boismann recovers from the attack, and with Boismann’s aid Aldor rushes the skeleton only to once again push it back. Duncan charges the same skeleton warrior, who is very resilient and is only pushed back. Hans recovers from routing. The remaining skeleton archer fires an arrow at the mayor, who suffers a gruesome death. Covered in the mayor’s brains, Aldor flees. While Hans and Duncan stand firm, brother Wendel decides he’s done his part of the deal in rescuing the boy and flees. 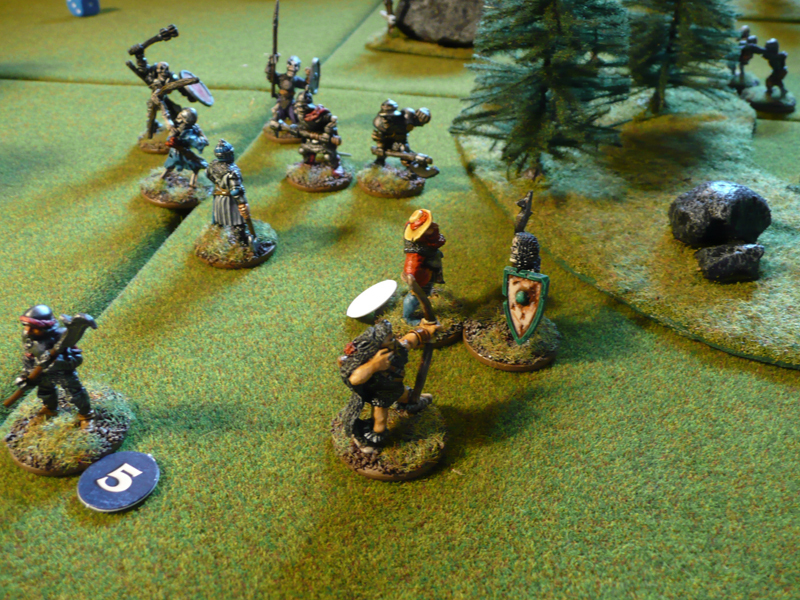 Two skeleton warriors move in on Duncan, and one engages Hans. The transfixed skeleton causes a turn over when trying to activate. Wendel flees off the board, but Aldor recovers. Duncan attacks a skeleton but is pushed back himself. At this point, the heroes decide they’ve gotten what they came for and quickly leave the battle field together with the severely wounded Raab and a very pale farmer boy. The mayor’s body is left to an horrible end in the fields, where the zombies feast on his carccass before returning into the woods. We thoroughly enjoyed the game, and I’m very eager to paint up the few minis we need for the next scenario.